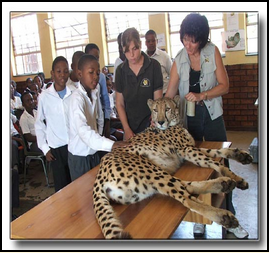 An educational Officer from the Centre will come and give learners a formal lesson supported by a power-point presentation and under controlled circumstances will be introduced to one of the Ambassador Cheetahs. This is a 35 to 40 minute presentation followed by the cheetah interaction. Stroking of the cheetah wil be monitored by the Educational Officer. Depending on the day, how comfortable he feels, noise levels, venue, etc. the cheetah should be ok with about 50 to 100 learners coming up and stroking him.